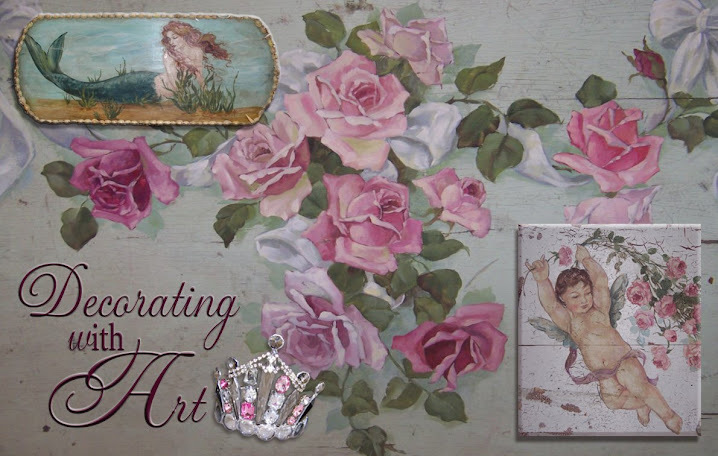 Decorating With Art: Something NEW!! OK, so it's been a while I know! But I've been keeping busy -- going to shows, working on my space at Country Roads, just doing a lot of creating in many different ways! I'm always looking for new things to create, and something new, fun and exciting came to me. I happened to see a store window display that had a French setting and motif, and it was so beautiful and inspiring - so I wanted to create my own take on a French window display. I've always painted old suitcases and had some laying around, and also work with glass, I thought, "I can try this". If I cut an opening in the suitcase, put glass in the opening, then the inside could be my window! 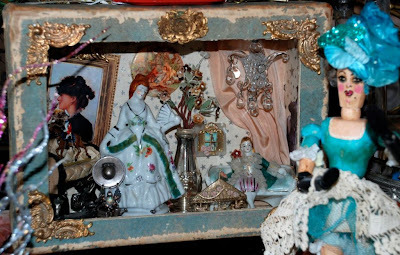 I put French miniatures, and other found objects, and voila! It became a mini store window - a take on an old idea of the "diorama". I had so much fun creating it! I took it to Spring Glitterfest and it was a big hit! Here's a picture. Then I thought of some very special customers and decided to do a themed diorama - here it is. I so enjoy these and have other ideas for my dioramas - I'll be putting some in my space at Country Roads and bringing them to upcoming shows - hope to see you there!! I absolutely LOVE what you create! You are so "original" and I will always love what you do and the person you are. I can't wait to see these at CR! so cute!! you are one creative chica. I am going into CR tomorrow morning to totally redo my spaces! Absolutely love the French minitures...you have an amazing talent GF!! Can't wait to see what you bring to the CR!